Native Americans consider themselves the "first people." But they waited until 1924, to get the right to vote. Since then, they haven't voted in large numbers. And they've been largely ignored or taken for granted by politicians. Now, Native Americans across the country are registering to vote in droves. They're considered a key constituency in Minnesota and several other battleground states where Democrats and Republicans are fighting for control of the White House. In northern Minnesota, Indians could also hold pivotal swing votes in several state House races. Bemidji, Minn. — Native Americans have long been the least likely ethnic group to show up at the polls. But when they do, they tend to vote for Democrats. At a recent DFL fundraiser on the Leech Lake Indian Reservation in northern Minnesota, tribal leaders were energized. Chairman George Goggleye says Indians are discovering they can have a real impact on the political landscape. As evidence, Goggleye points to the 2002 election in South Dakota, where Democratic U.S. Sen. Tim Johnson won a narrow victory over a Republican challenger. "He (Johnson) was elected primarily by the Native American vote," said Goggleye. "And I think it's about time that we come together and show how much strength we have, how much political clout we carry when we band together." Political experts agree, and Indians are mobilizing. Minnesota is one of eight states targeted by a national get-out-the-vote campaign sponsored by the National Congress of American Indians. Organizers pledge to get one million Indian voters to the polls this fall. That may be an ambitious goal. Indians have a unique status as American citizens, and citizens of their Indian nations. Many Indians have long scorned the right to vote in non-tribal elections. They've been reluctant to get involved in what some Indians have described as "the white man's government." But those attitudes are changing. On the Red Lake Reservation in northern Minnesota, tribal officials began an aggressive get-out-the-vote campaign about a decade ago. In 1996, a huge voter turnout elected a Native American to a county board for the first time in Minnesota. It was the beginning of a trend. 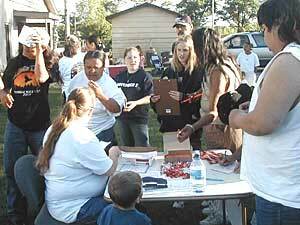 In 1998, voter turnout on the Red Lake Reservation was 83 percent. That was 20 percent higher than voter turnout statewide. Two years ago, observers say the Indian vote on Red Lake was decisive in electing a DFL candidate to a state Senate seat. We're seeing candidates pay more attention to Indian Country. I mean, 10, 15, 20 years ago, they just pretty much ignored us... But they can't do that anymore, because we could break or make an election for them. Judy Roy, the Red Lake band's tribal secretary, says 2004 will be a banner year for strengthening Indian political power. "I think it's invigorating," said Roy. "I think it's something whose time has come -- that Native Americans, the first Americans, are becoming acknowledged as part of the society we live in." This year's closely divided American electorate has made the Indian vote more important than ever. But the most significant factor in the political awakening in Indian Country may be the advent of Indian gaming in 1988. Tex Hall is a tribal chairman in North Dakota and president of the National Congress of American Indians. Hall says tribes with successful casinos can now afford to lobby for their interests. It also makes them political players. "I think it's had tremendous power because of two things that politicians really look for, are votes and fundraising," said Hall. "And so, with the $14 billion or $15 billion dollar total Indian gaming proceeds that allows some tribes to really provide financially for those candidates who really support tribal sovereignty, tribal issues, and of course including the right to do Indian gaming within their reservations and states." Political contributions from tribes have skyrocketed. It's a trend that's been tracked by the Center for Responsive Politics. The center's study shows that in 1992, casino tribes nationwide gave about $145,000 to federal campaigns. A decade later, that number topped $6.7 million. This election cycle in Minnesota, nine of the state's 11 tribes have given more than $335,000. Most of the cash went to Democrats, but Republicans are getting a bigger share than they have in the past. Michael Meuers is a district chairman of the DFL Party in northern Minnesota. In the 1990s, he worked for the Red Lake Band on their successful get-out-the-vote effort. Meuers says Indian support for the DFL remains solid. But he says it's probably not as strong as it once was. "I think that there certainly is a perception among many Indian people that the DFL has taken them for granted," said Meuers. "And again, I think that may be another reason to get out the vote, is to let both Democrats and Republicans know what kind of political power that they have." Meuers says Indian voters could play a key role in the race for Minnesota House seat 4A, which includes all of the Leech Lake Reservation. DFL challenger Frank Moe has campaigned aggressively on the reservation. And the incumbent, Republican Rep. Doug Fuller, says he's spending more time campaigning in the densely populated area around Bemidji. Fuller has been in the office for three terms. In the past, he hasn't done well with Indian voters, and he doesn't expect that will change much. But Fuller believes there's a growing number of "closet Republicans" on the reservation. "If the tribes look at the old question of, 'What have you done for me lately?' and look at the two parties, I think they'll find that the Republicans have been pretty good to them," said Fuller. "The extended hand is out there. Republicans aren't the anti-Christ." In a vacant parking lot on the Leech Lake Reservation, young Indian people fill out voter registration cards. Cass Lake Mayor Elaine Fleming is there, too. She helped organize the youth rally, called "Rock the Vote -- Rez Style." Fleming says attracting a new generation of voters is key to breaking a cycle of political apathy among Indians. "These are the young adults who could swing the vote," Fleming said. "And I don't think anybody has ever reached out to them and said, 'Yeah, we value you.' I hope that we would become like a voting bloc here." Even though a majority of people in Cass Lake are Indian, Fleming is the city's first Native American mayor. She's also considered the first Green Party mayor in Minnesota. The Green Party has been attractive to quite a few Indian voters. In the 2000 presidential election, Green candidate Ralph Nader beat George Bush on some reservations. It probably helped that Nader chose Winona LaDuke as his running mate. LaDuke is a Native American from the White Earth Reservation in northwestern Minnesota. Bob Shimek is from the Bemidji area and a member of the White Earth band. He says it's all about having a choice. "Some people within our community are just really sick and tired of what we're coming to call 'Republicrats,'" said Shimek. "By voting Green or some other progressive party, if it sends the message to the Republicans or the Democrats that if they want that vote back, they better start listening, not just coming to us and telling us what they're going to do for us and then walking away." Shimek predicts most Minnesota Indians will continue to support Democrats. A few will support Republicans. Either way, he says, this is a pivotal year for Indian tribes across the country. "More and more, we're seeing candidates pay more attention to Indian Country, he said. "I mean, 10, 15, 20 years ago, they just pretty much ignored us. Blew us off. But they can't do that anymore, because we could break or make an election for them." Organizers of the get-out-the-vote effort say there are potentially about 33,000 Indian voters in the state. Observers say that's significant, and could make a difference in a tight presidential race. The Native American population is much larger in states like Arizona and New Mexico. There, both presidential candidates are running campaign ads in Native languages. But here in Minnesota, neither President Bush nor Sen. John Kerry has so far reached out directly to Indian tribes.